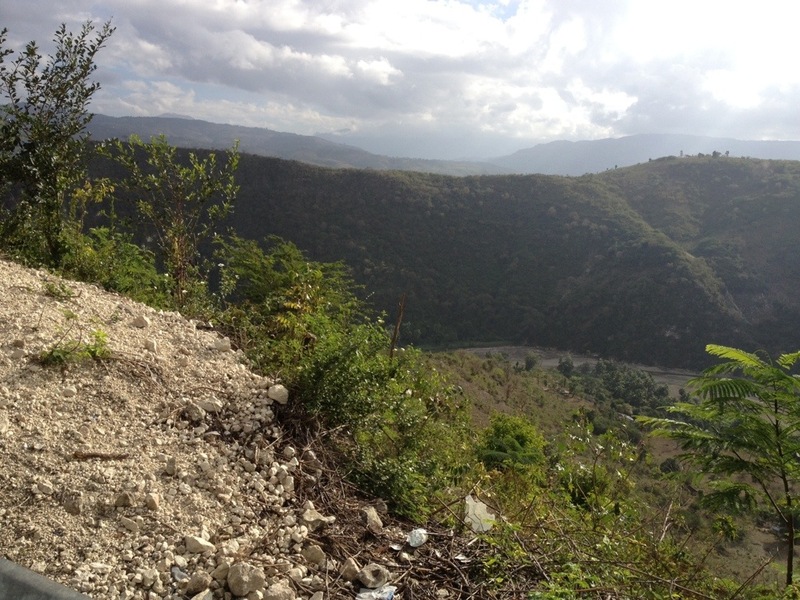 Today we say “so long” for two weeks to our home in Jacmel. We will be traveling to New Jersey, February 16-March 2. 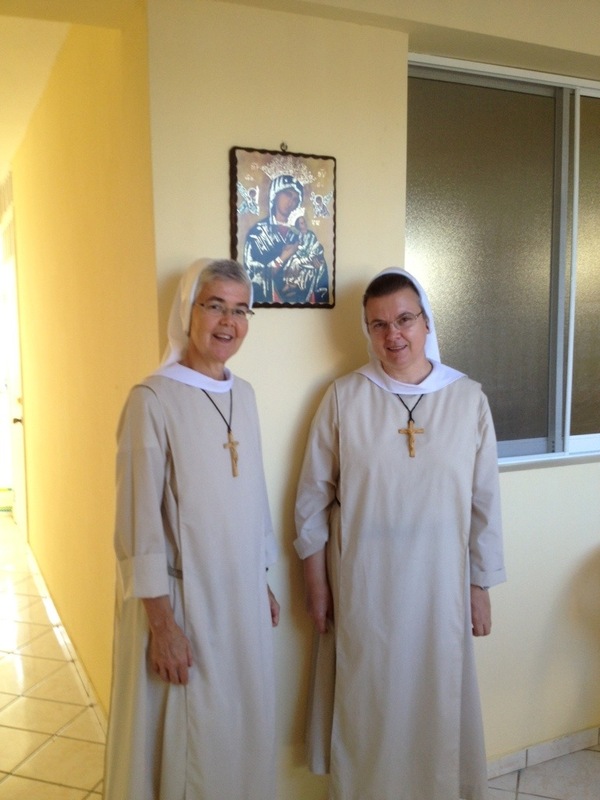 Please pray for Sister Marilyn’s mother who is in the hospital after having some heart problems. Bondye beni ou! Early this morning, we went with Father Rosseau to St. Michael’s Parish, which is on the other side of town, for our Ash Wednesday Mass. 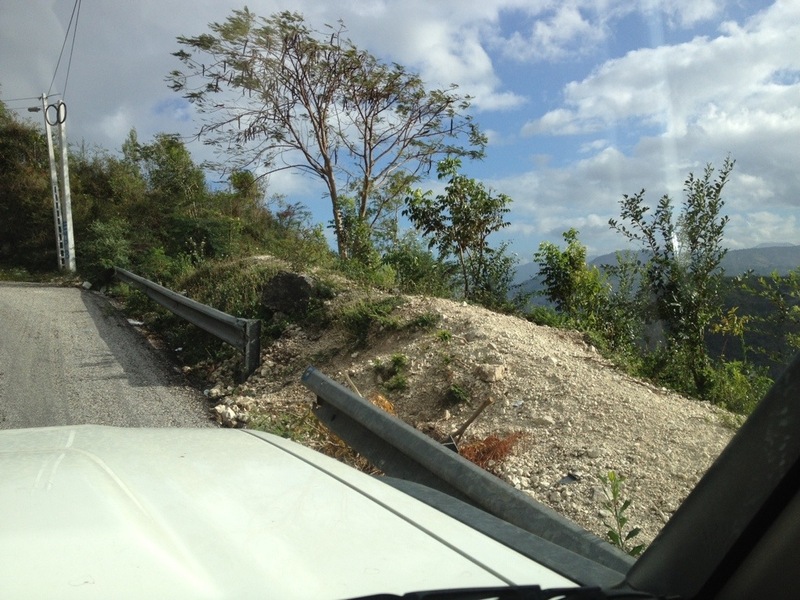 Driving through the town of Jacmel, you could see the remains of Carnival 2013. Sonya, our neighbor, went with us. 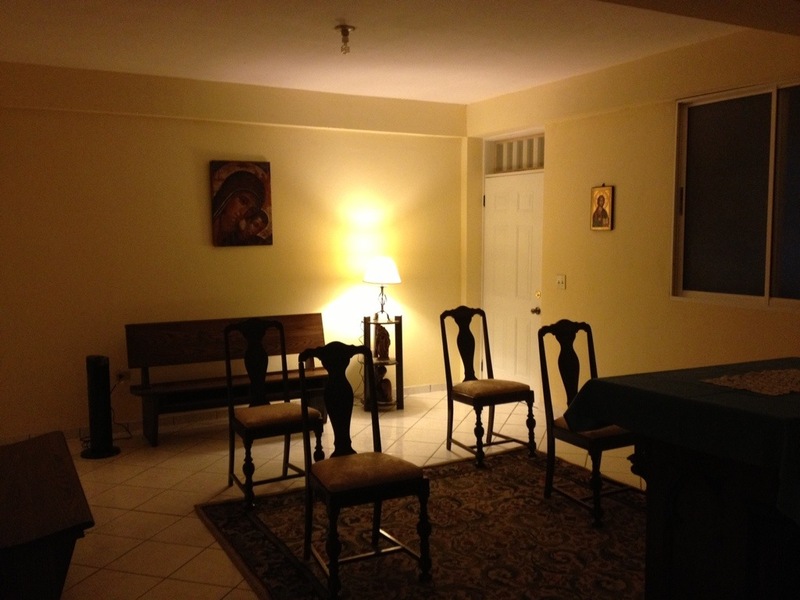 St. Michael’s was damaged by the earthquake so, for now, the people of God need to worship in an outside space. We were moved by the deep faith of the people who gathered for Mass and the distribution of Ashes, and were moved by the beauty of the liturgy. 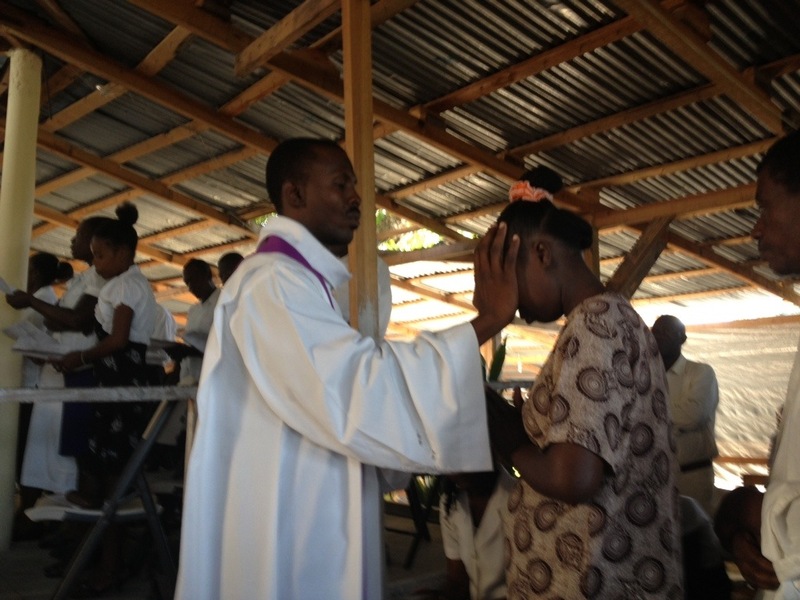 No one was in a hurry; the priests took their time to mark the forehead of each person with a blessing. 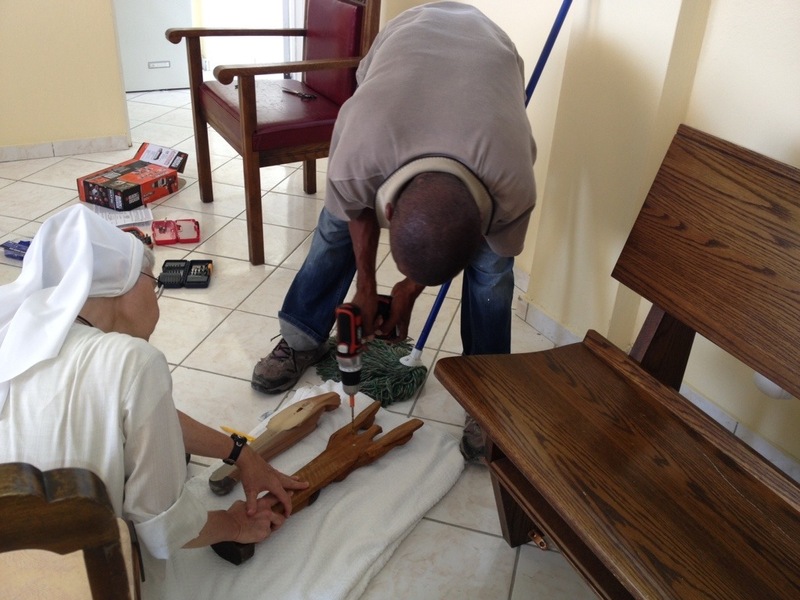 As Jacmel continues to celebrate its last day of Carnival, we continue to work and prepare our new convent, Our Lady of Perpetual Help. 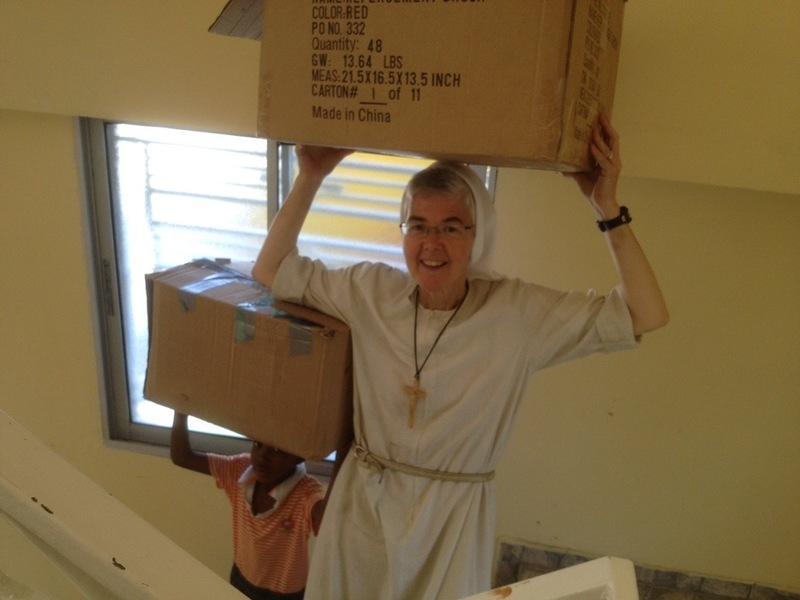 Unpacking the many boxes, we shared what they contained with many people. One great need is shoes. We had many in the container and have been distributing them everywhere. To go to school, you must have a pair of shoes. Sneakers are a great gift, especially for those who live in the mountains. 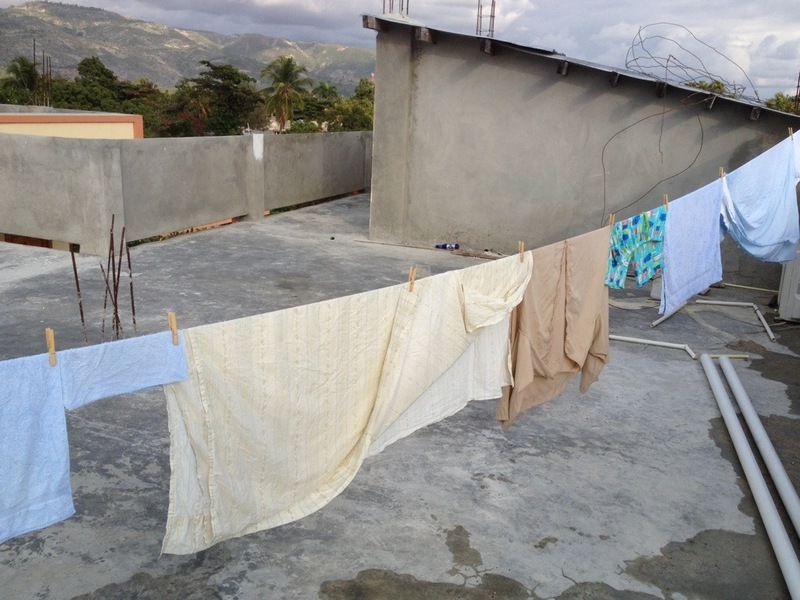 The clothes that we received have been distributed. Here you see Cassandra, who has a new outfit: shirt, pants, and sneakers. Even though the shirt and pants were used, she never had anything as nice as this; and she came to our door, wanting to show us what she looked like. 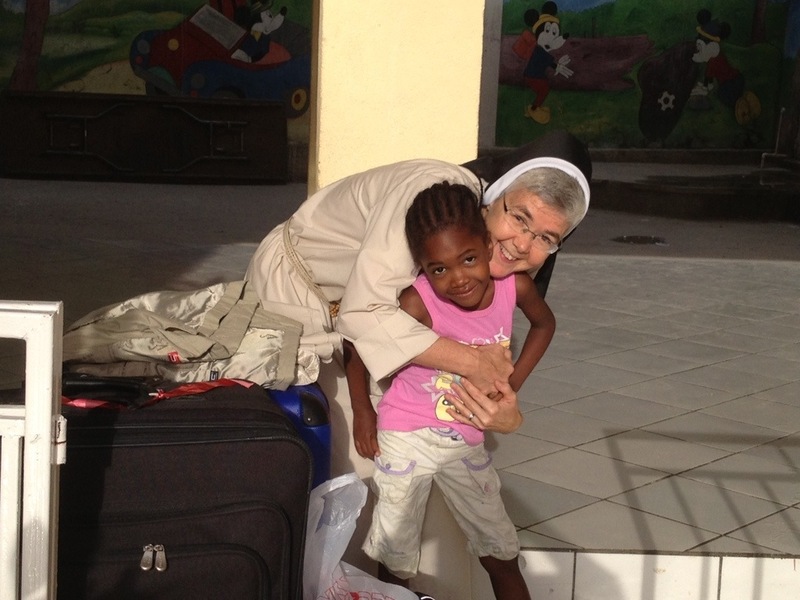 We are so grateful to all of you for your generosity and kindness. 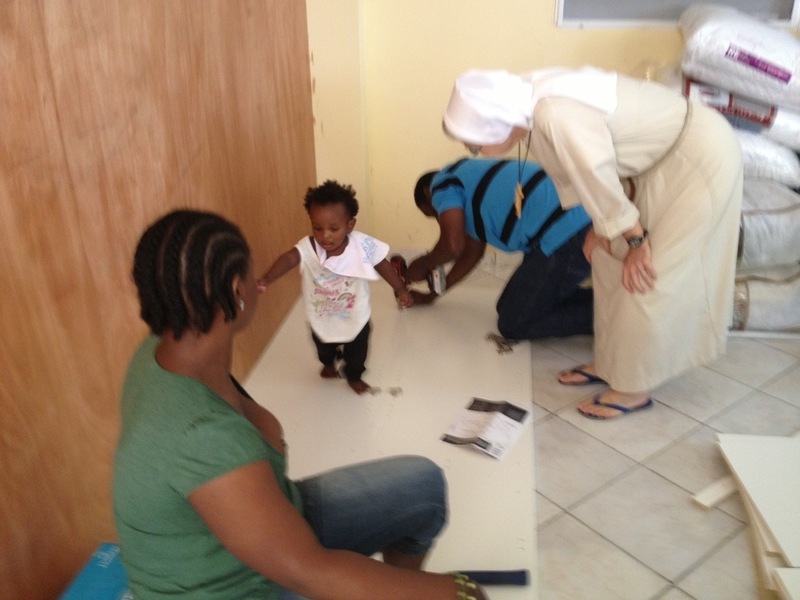 Among the blessings we have received are the many people who have come to our door to help us. 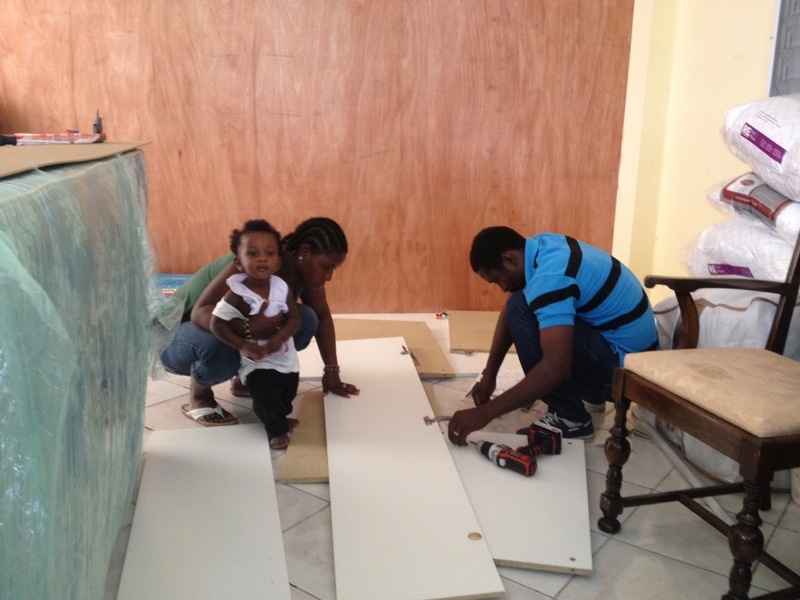 Today Jacque, our Creole teacher, together with his family, came to the house and offered to help us. So they worked on putting together beds and a closet. We made dinner to thank them for their kindness. 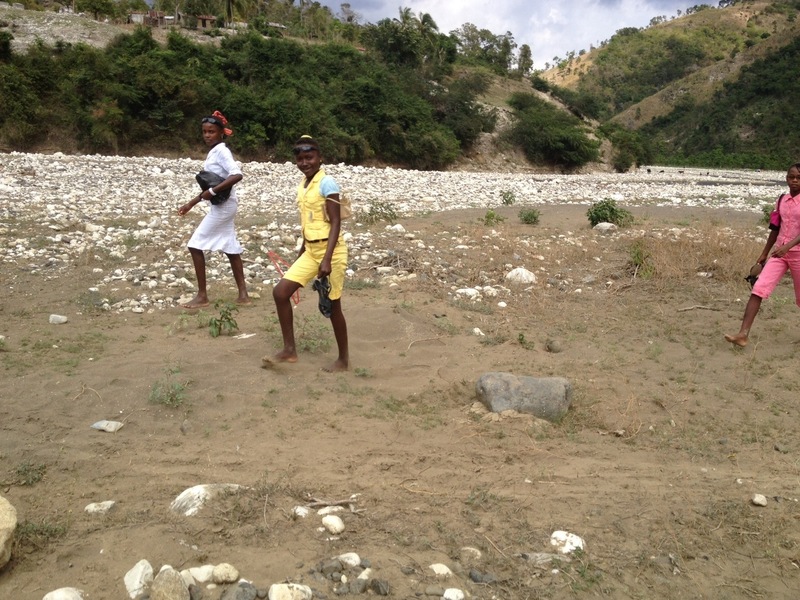 It was our favorite recipe here in Haiti: berijen (egg plant) and spaghetti. In the evening Father Gaston, pastor of St. Yves, stopped by. 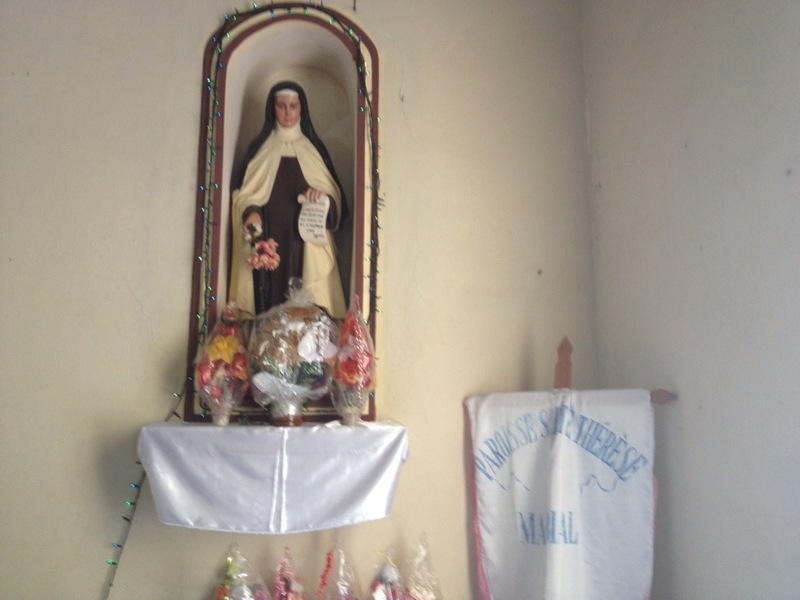 We gave him some needed church items, as well as some stuffed animals for the children in his parish. 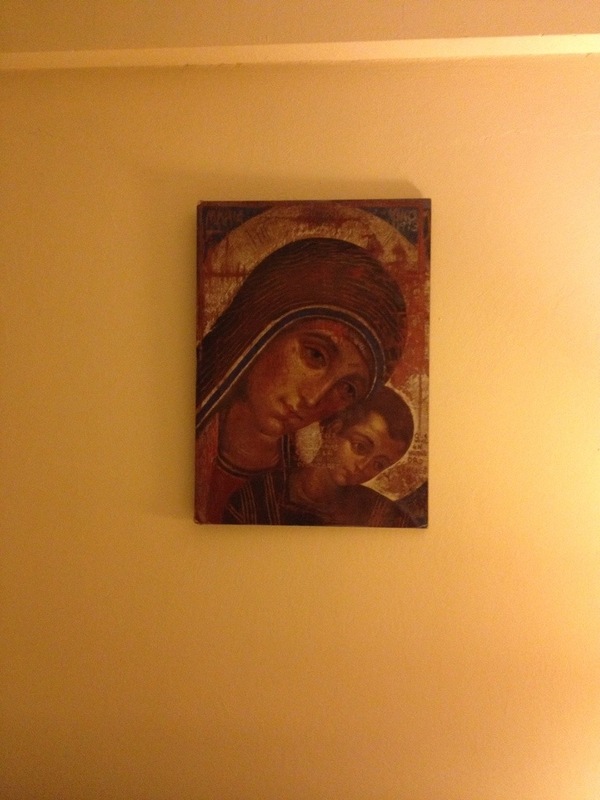 The biggest joy was when we gave him a picture of John Paul II. 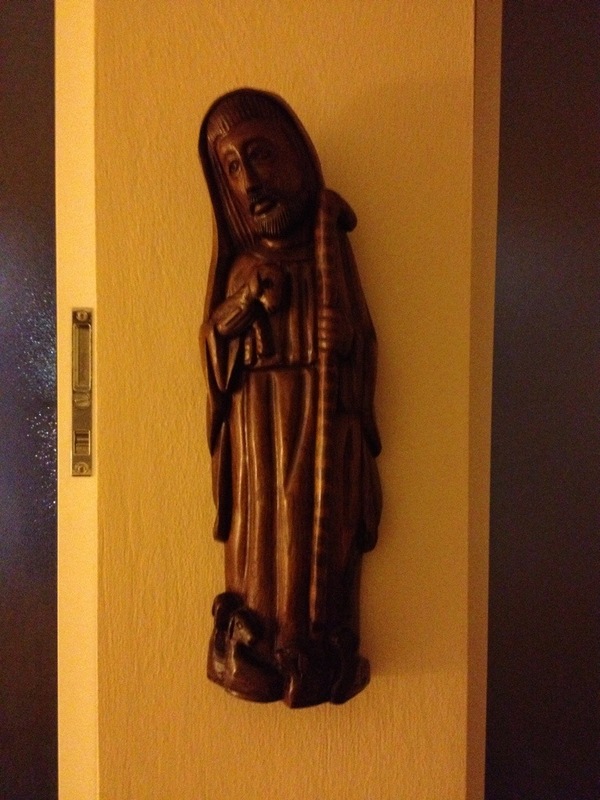 He has very fond memories of JP II’s visit here to Haiti in 1983. 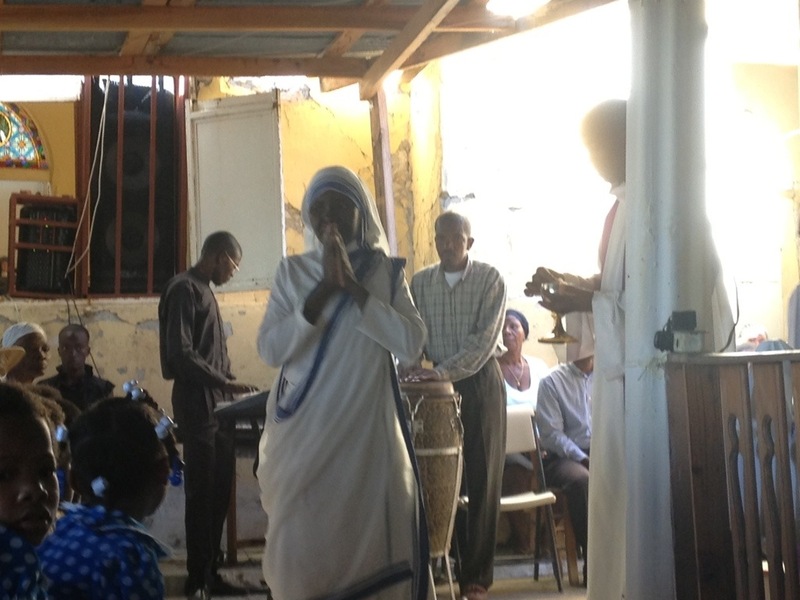 Today we were invited to St. Therèsè of the Child Jesus Parish that is located in the mountains. 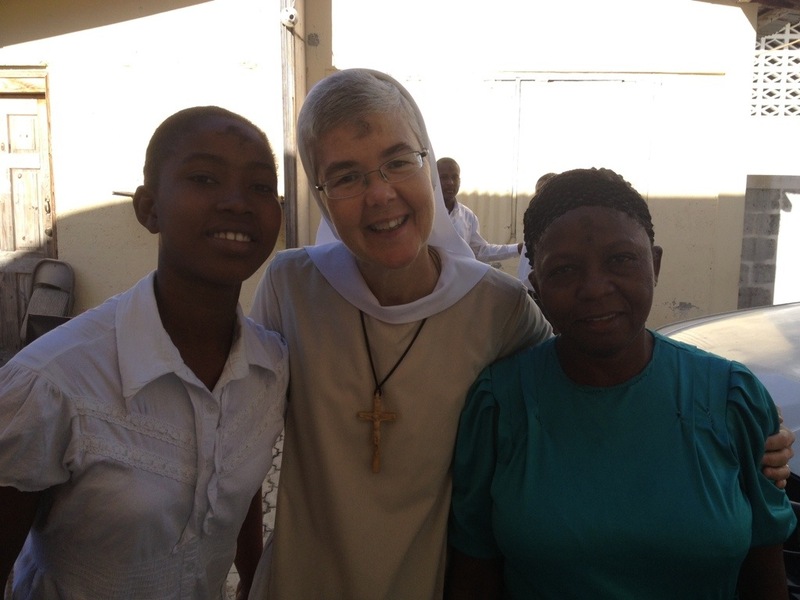 They celebrated their parish feast today; we are not sure why, but the celebration was great. 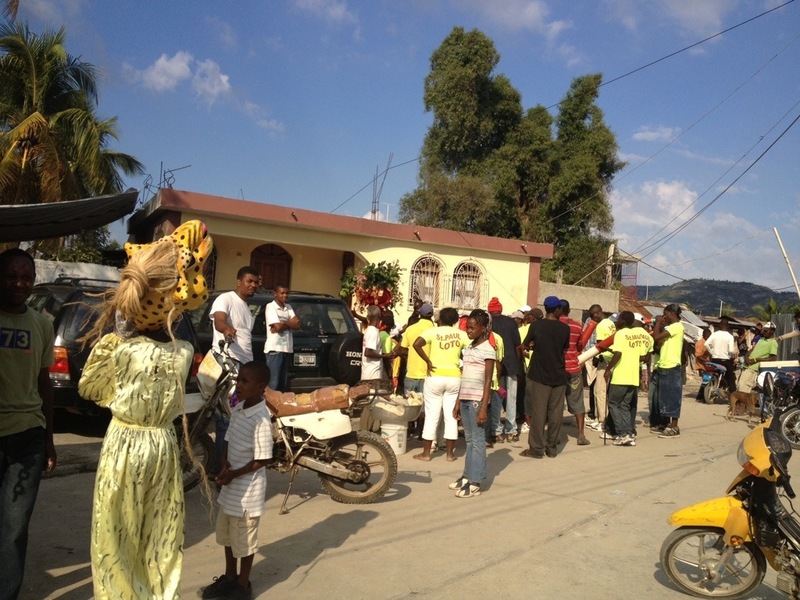 Everyone in the village comes to celebrate. 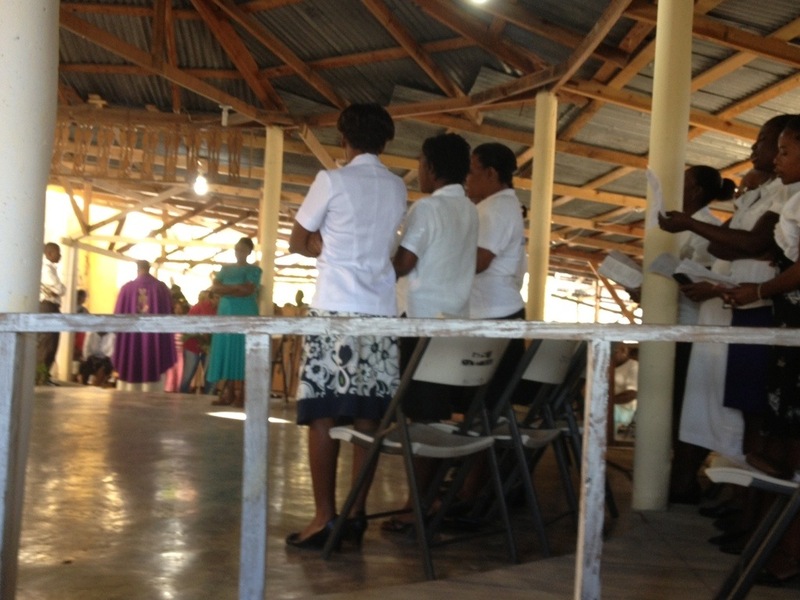 Priests gather from other parishes to show fraternal support. 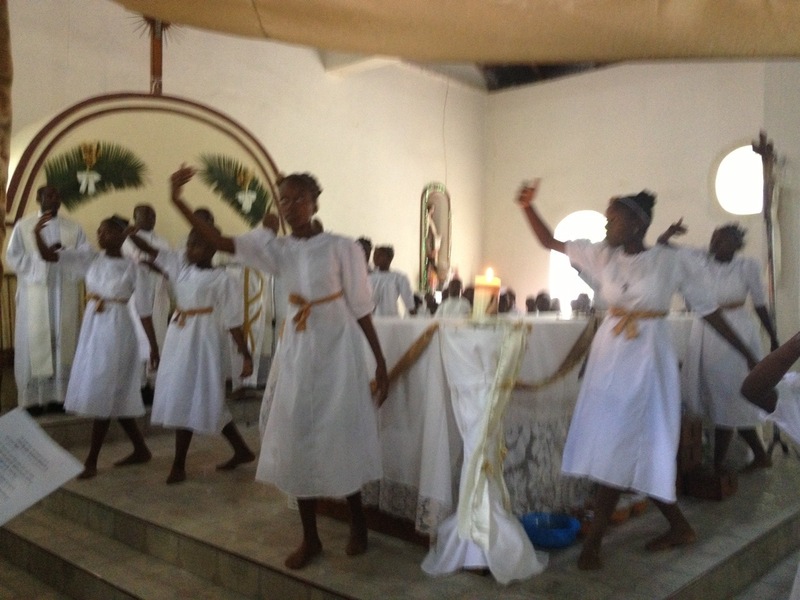 We were moved during the Eucharist by the beautiful offertory procession and by the dancing after communion. 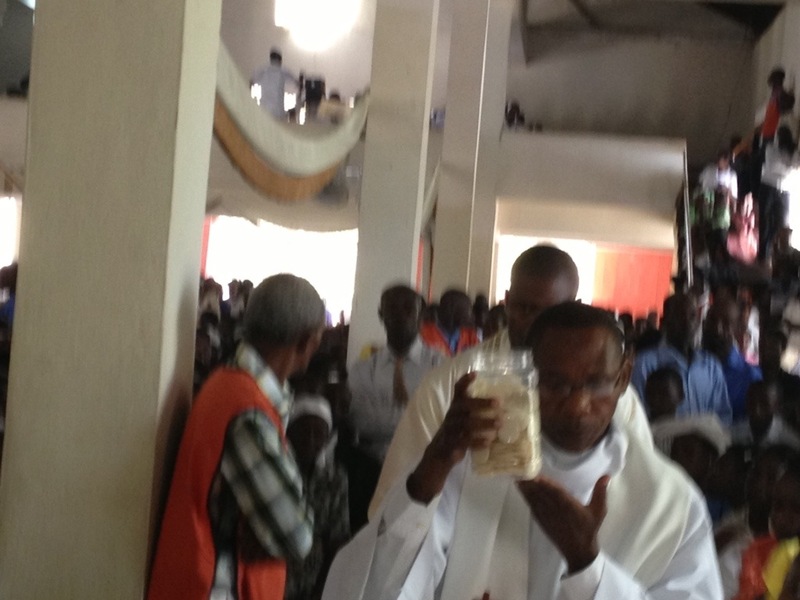 As you see in one of pictures, there is great need for liturgical vessels, especially ciboriums. 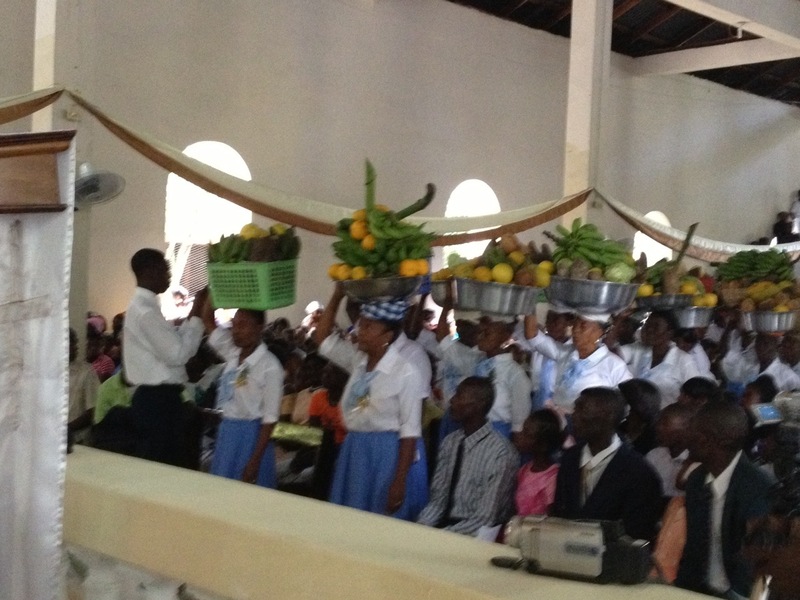 After the Mass, there was food for everyone! 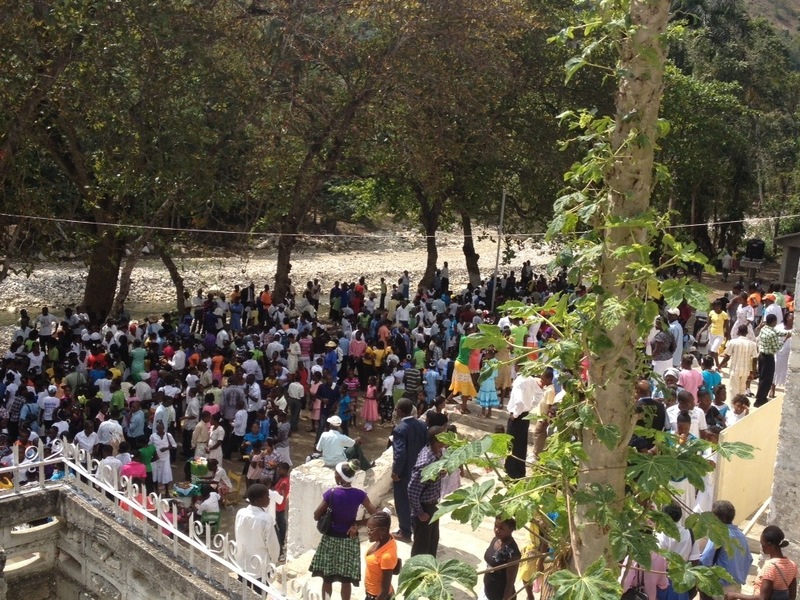 People gather wherever it is possible–on the ground, Church steps, everywhere. 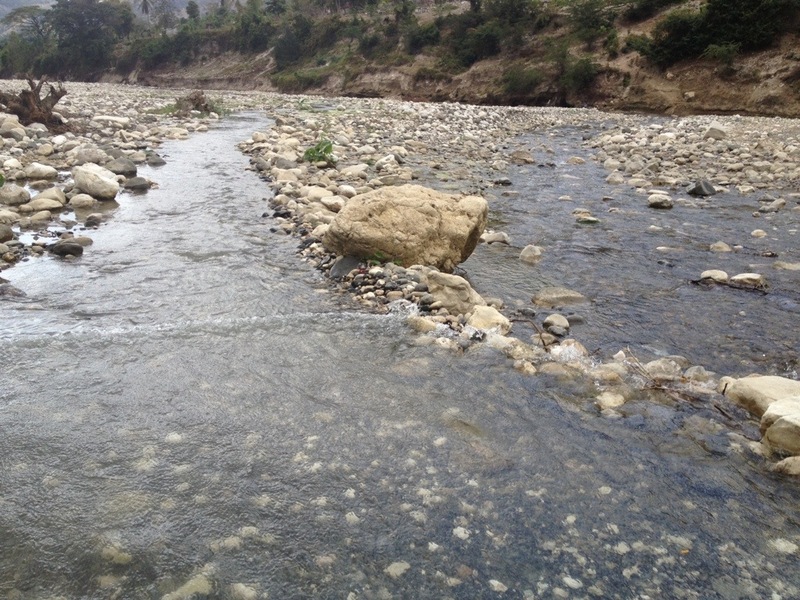 Once again we had to travel on rocky roads, and we had to cross over a winding river a number of times. Thank God we had a good driver! We were passing people who were walking barefoot, carrying their shoes, so when they arrive at the church their shoes will be clean. It was so humbling to see this gesture of respect for the Lord’s house. 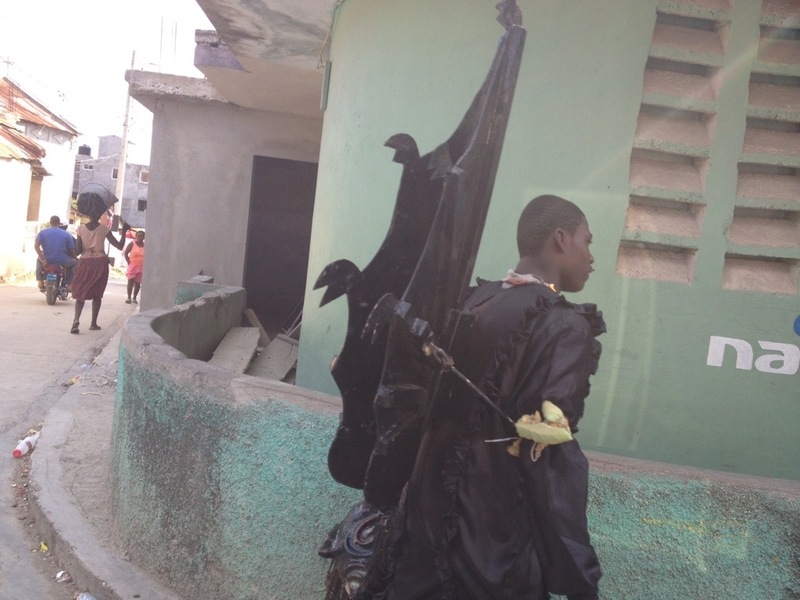 When we got back into Jacmel, the people were celebrating the last days of Carnival. We saw many people in masks and costumes. 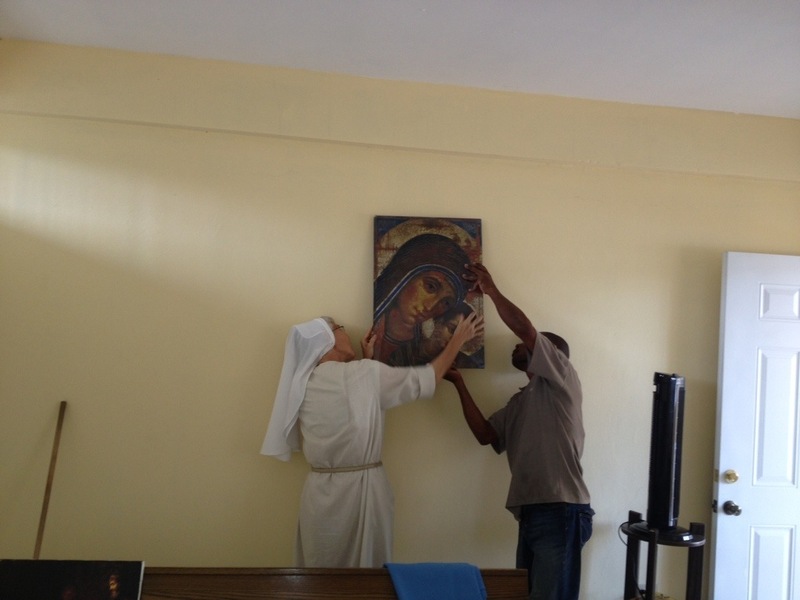 We continue to work from morning until night in setting up our new convent, Our Lady of Perpetual Help. During the day we have visitors who stop by because they see us through the bars on our balcony. 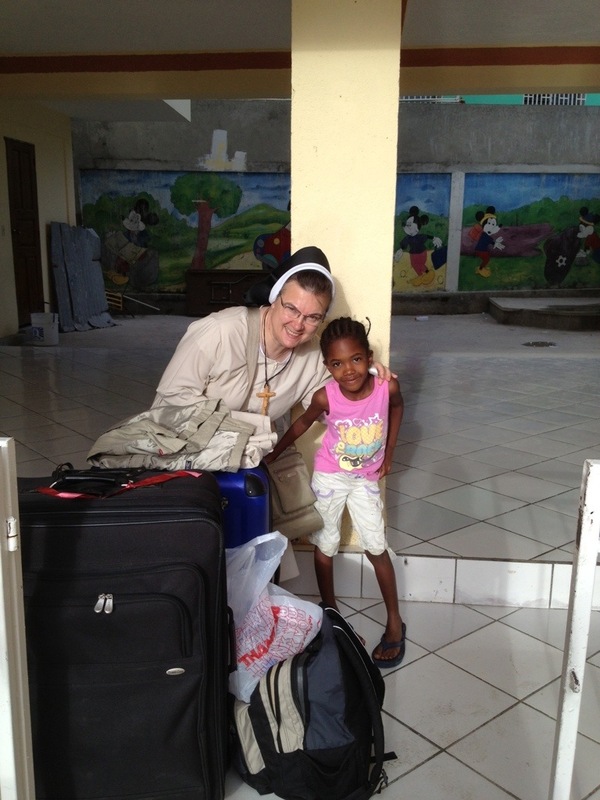 Sister Marilyn is learning from Cassandra, the daughter of our caretaker of the grounds, how to carry things on her head. We gave Fr. 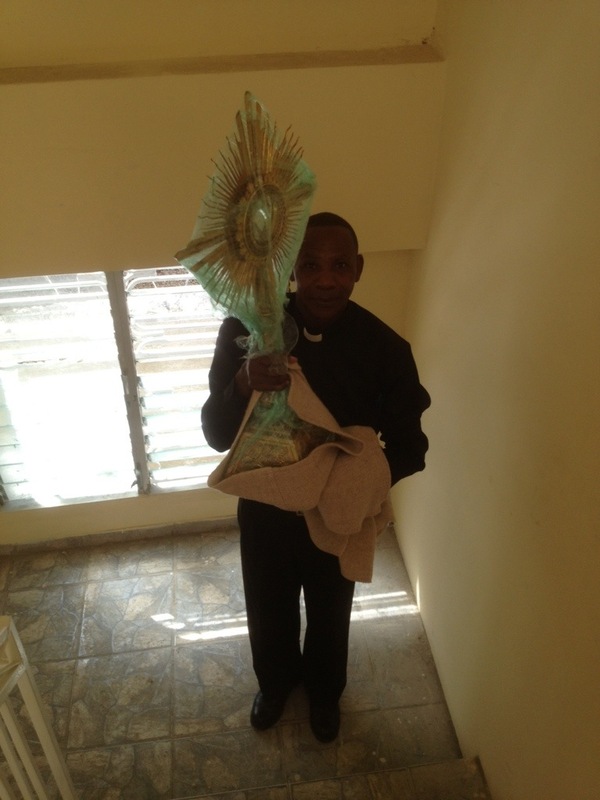 Gaston, Pastor of St. Yves Parish, one of the monstrances we brought in the container. We wish you could have seen his joy! Today we tried to put together our beds so that we could return those we borrowed, but we could not figure it out. 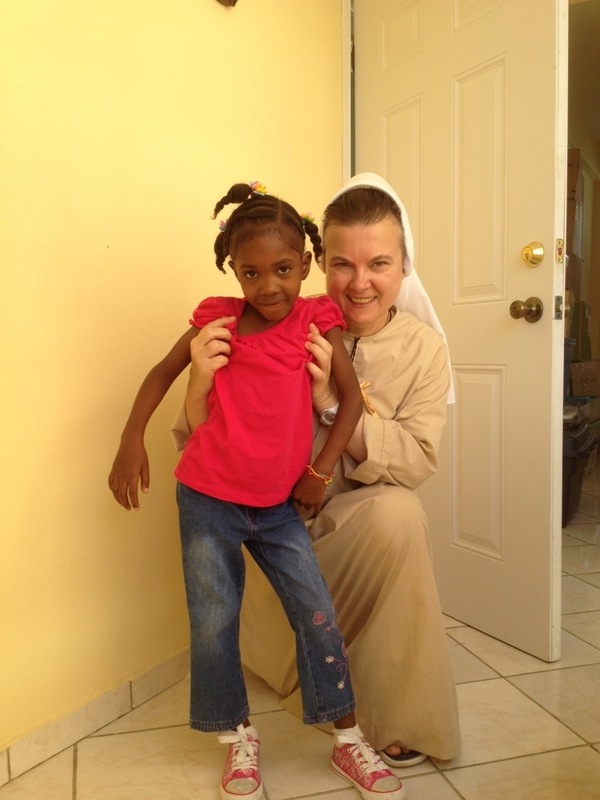 So we called our Creole teacher, Jacque,s who came to the rescue. 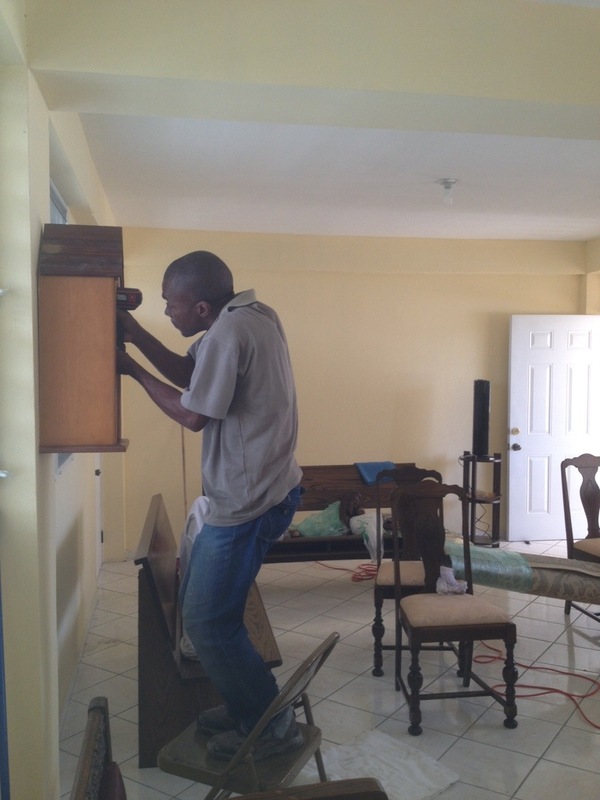 In such a short time, we are learning how to do many things–put together fans, use a drill, put beds together, set up a gas stove using a propane tank, refrigerator, washing machine, closets and lamps. Today we did our first load of laundry in our new washing machine. We can only use it when we have water and, for past few days, we did not have any. Of course, we say it in Creole. 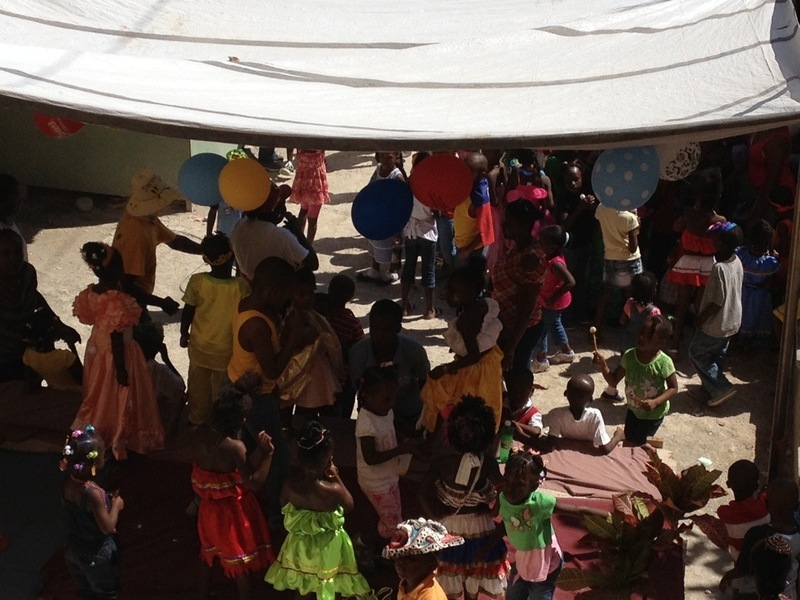 The pre-school that is below us celebrated Carnival. 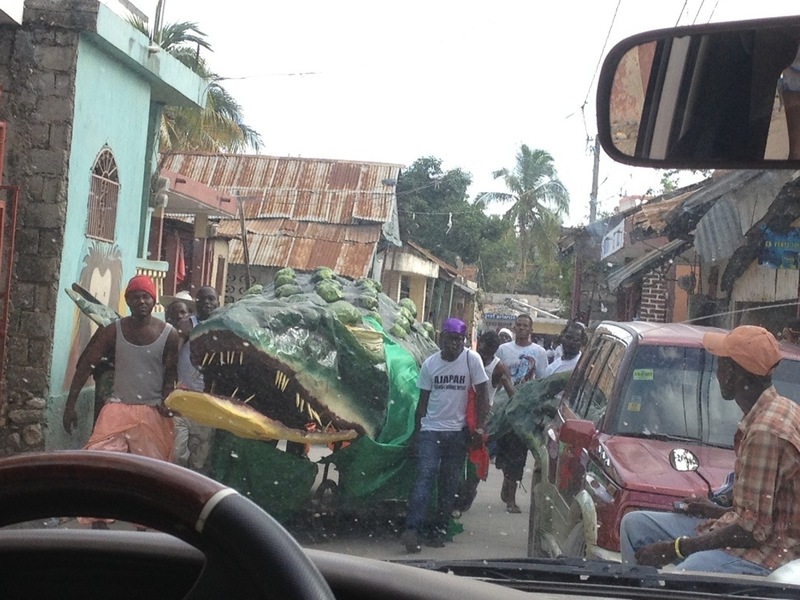 This is a serious tradition here in Haiti. The costumes, music and dancing are beautiful, loud and, creative. 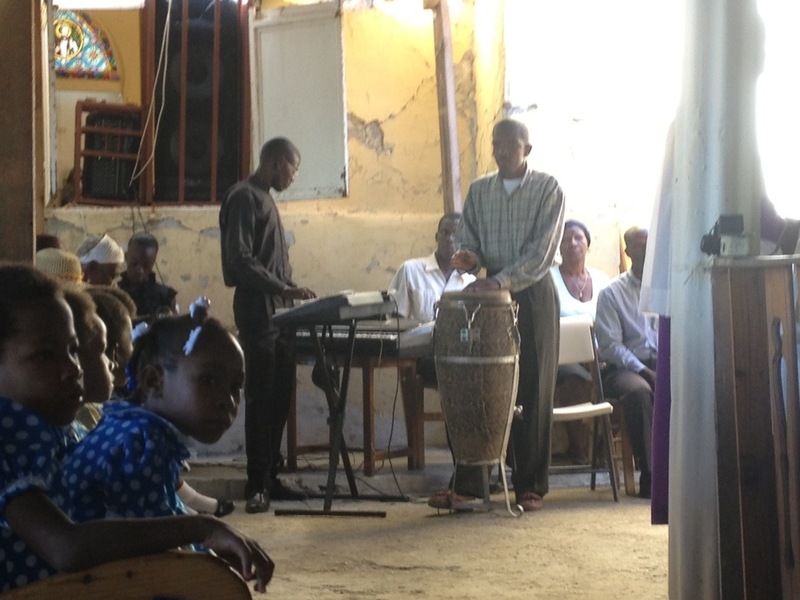 Today we have come to Mount Zion, the city of the Living God; we finished setting up our chapel! 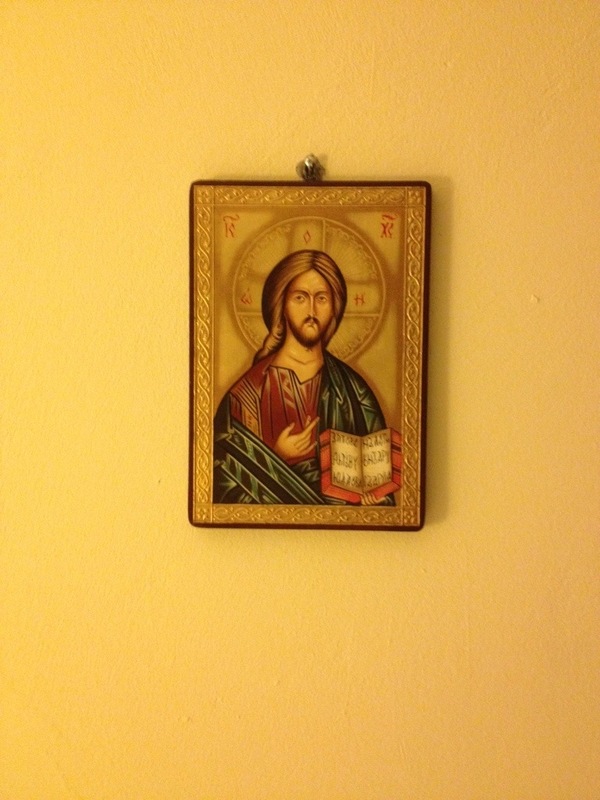 Everything you see in the chapel was donated by our Felician Sisters, especially from Mt. Arlington, NJ. During our Evening Prayer and Communion Service, we solemnly processed to Blessed Angela’s statue and placed her relic by her feet. 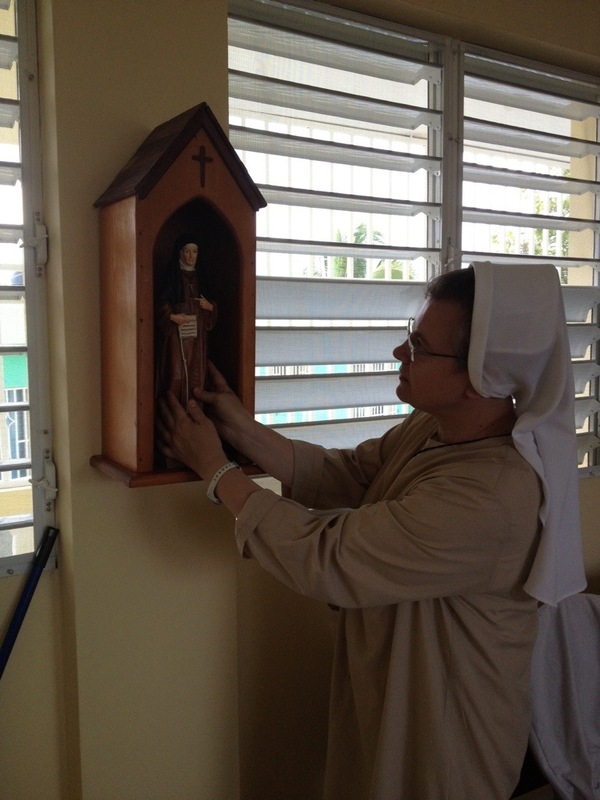 The statue of Blessed Mary Angela was donated by the Sisters at St. Stanislaus Convent in Garfield, NJ. 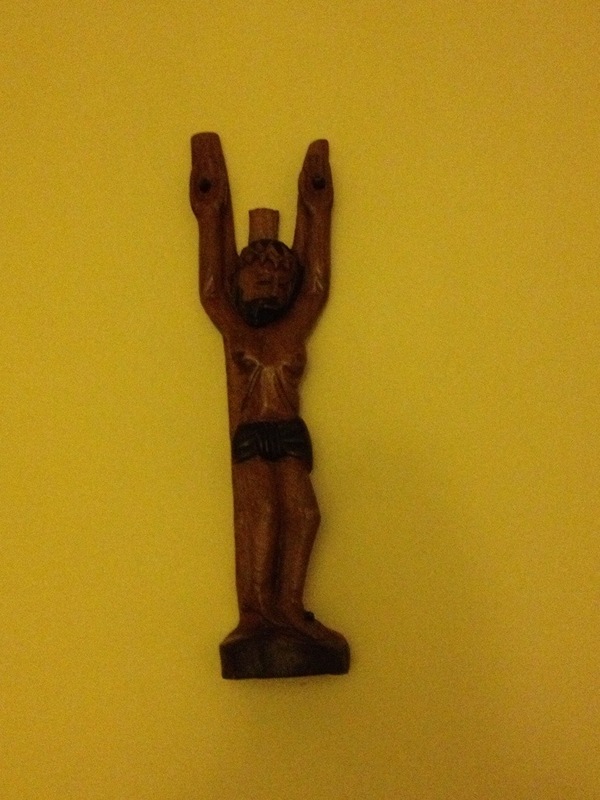 The crucifix and Good Shepherd were those we bought from local artists last year in Port au Prince. 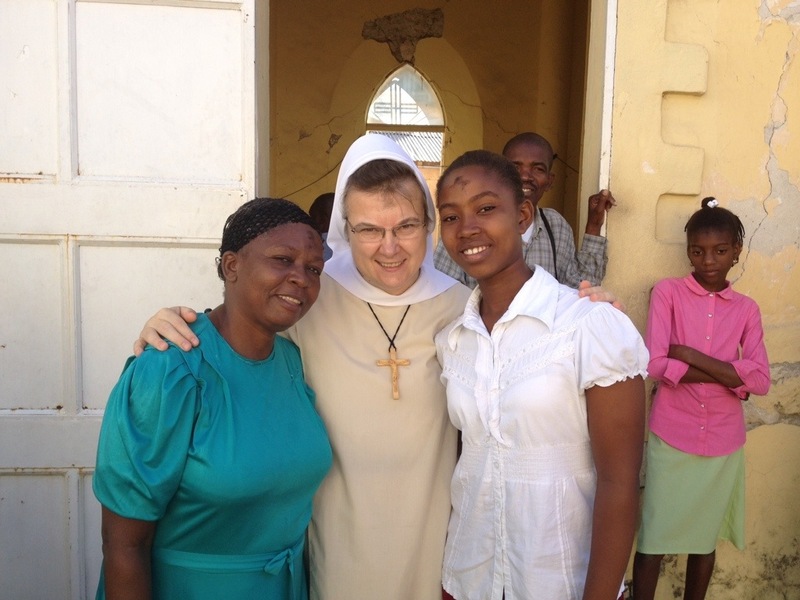 We are very grateful to all of you, that the spirit and legacy of Blessed Mary Angela is now here in Haiti. 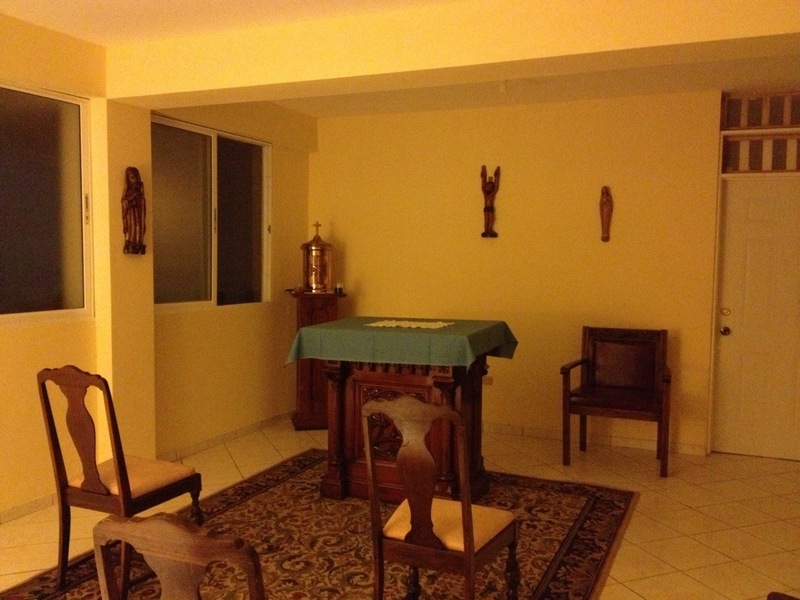 We look forward to having you come and pray with us.